Have you heard of Mohandas Gandhi and Martin Luther King Jr.? They had 2 things in common. What’s less known of Tolstoy is his fascination with white bears. In the 1830’s, the child Leo Tolstoy received a challenge. His beloved older brother Nikólenka challenged him with a bet: don’t think of a white bear for 5 minutes. He accepted. By trying to avoid a thought, he paradoxically ruminated over it. Defeated, he paid his brother his just reward. Tolstoy’s brother didn’t realize it, but his image of a white bear had all the hallmarks of a memorable image. It was novel, strange, unemotional, and specific. These are characteristics that our brains scan for to learn about our environment. And it’s those characteristics that Harvard psychologist Wegner preyed upon. He channeled his inner Nikolenka and asked for students to not think of a white bear. They would verbalize their streams of consciousness (saying out loud every thought that came to mind). If a student thought of a white bear, he/she was to ring a bell. He found that thought suppression was paradoxical to the goal. If you didn’t want to think about something… well, you are more likely to think about it. First time meditators know that when they try to meditate and “not have thoughts”, they’ll have all of them. Stressed about a performance review, and trying to not think about it? Chances are, it will permeate your every thought in the gym, on the couch, and in bed. So what else does the “white bear task” do for us? It can be used experimentally by quickly depleting willpower. 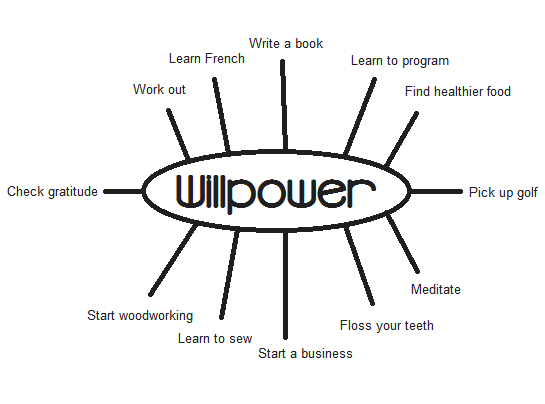 What Do We Know About Willpower? Researchers hypothesized that, if willpower all came from a single source, then forcing participants to suppress thoughts, emotions, or impulses would decrease the ability for them to use willpower on a later task. An example of a Stroop task. The goal: say the COLOR of the word, not the word. Ego depleted participants messed up more often than a control group. That’s because we often don’t recognize how to change. Enter ego depletion. This creates a dependable way to measure ego depletion through behavior, but realizing we’re ego depleted after downing an entire box of cookies is NOT beneficial. So researchers sought the subjective experience of depletion. There were 2 subjective experiences that were associated with ego depletion: stronger emotions, and stronger urges. When you’re ego depleted, your emotions are stronger (brain science calls this “high arousal”). You will feel higher highs, and lower lows. There’s one big takeaway from the studies. There isn’t a single emotion that is symptomatic to ego depletion. Instead, ALL your emotions are heightened. Shifts in the overall intensity of your feelings are a sign you are ego depleted. If you feel especially nervous or angry by the end of the day, or, you’re unusually cheerful and want to “treat yourself to something”, you’re ego depleted. What makes withdrawal so difficult for addicts, even ones that don’t create huge physical dependencies? The common word I hear among friends who try to quit smoking is “cravings”. Where, suddenly, you simply feel obligated to take a puff. The rest of the night is spend distracting yourself, trying to not smoke, fighting back against the compulsion to light up. Both impulse control and emotion control are part of willpower. And using it all up in the chronic battle of drug addiction will leave you in a manic state of self-distraction and tidal emotions. But as soon as an ex-smoker caves, it’s like they’re back to normal. It’s not the nicotine. It’s willpower being unstained. When you are low on willpower, you’ll get more frequent urges, and feel less power to resist them. It might be enough for you to know when you’re vulnerable and make distance from distractions. But there’s an even better use of this knowledge. Willpower is needed especially for new habits. Here’s a catch-22 for habit change. You want to make habits because they don’t require willpower to maintain. BUT, you don’t have enough willpower to make the change stick. So how do you form a habit? Here’s the secret. When you form a habit, you are injecting a change to your routine. A change to routine requires impulse control — because you’re fighting the impulse to continue your old habit — which means new habits strain willpower. We know willpower is a finite resource. So what’s the solution? 1. Start with a single, brain-dead easy habit. If your entire day is a cognitive strain, riddled with decisions, anxiety, and fatigue, there’s a catch-22 between “trying to make change” and “being willpower strained all the time”. In that case, I suggest that whatever new habit you create — whether a gratitude journaling habit, a meditation habit, or a fitness habit — be made with the tiniest of steps. Make it require almost no willpower at all. If you want to run in the morning, don’t resolve to do it. Make it a habit to put on your shoes and walk to the door in the morning, as you wake up. Don’t run. Don’t feel obligated to run, but do it if you feel like it. Just put on your shoes on and stand at the door. After 7 consecutive days, raise the stakes. Step outside the door. Then? Run for 1 minute. See how small these changes are? And with enough time, these small changes become huge change without straining willpower. Soon, you find each step automatic. You wake up, you put on your shoes, you run. This is why New years Resolutions fail so often. Every new year is filled with hope, high arousal emotions, and optimism. Unfortunately, we tend to overestimate what we can do in a short period of time. 10 This is especially true of habit change. Before: Willpower spread between lots of new changes. Absolute cognitive overload. Your willpower cannot cover all your voluntary habit changes. You are doomed to enter ego depletion, and that will make change very difficult. But, what if this is how you designed your resolution season? All that focus on a single change makes it easy. It makes it REALLY easy. And honestly, what would you rather have: a million broken promises to yourself, or a single (potentially life changing) habit change like consistent exercise? Remember the second takeaway of Baumeister’s research. 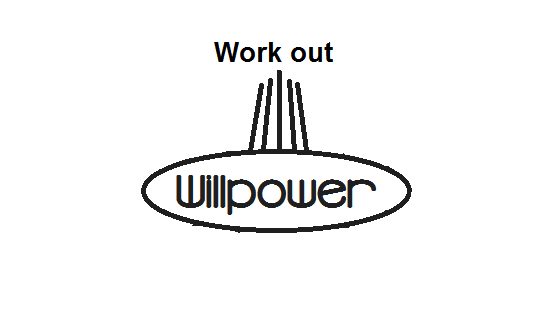 Willpower all comes from a single reservoir, so you must focus on as few changes as possible to keep willpower reserves stocked. Do this, and you’ll finally get past that dip in habit formation. A habit requires willpower mostly at the beginning. As you become more proficient and the practice becomes more routine, it requires less willpower. At some point, it will require no willpower at all. A personal example would be my gym attendance. Pre-built habits take little or no willpower. Me going to the gym is an automated process now — I use energy and I’m challenged, but I do not need willpower to control impulses to do other things. You want to focus your attention on making it easy. So easy, that you’d be ridiculous to say “No”. If you want to eventually run, start by just put on your running shoes. Focus on a single big change at a time. Because if you scatter your willpower out to a million big things, you’ll never get one big thing done. Be cognizant of your weakening willpower during the day. Wnen you’re ego depleted, avoid places of temptation. I fill up a large bottle of ice water and avoid all kitchens. If even the slightest flare of hunger comes, I’m 1000 kilocalories heavier. When you’re ego depleted, it’s easier to emotionally trigger. You may get more angry at your significant other for trivial things. You may suggest your life is at an infinite downward spiral. Recognize your amped up emotions and sensitivity to things, take a deep breath, and let it go. Don’t let your ego depletion take control of you. And above all, never eat salads. They are void of nutrition and flavor: just vehicles for dressing. Mohandas Gandhi named his South African commune “Tolstoy Ranch” in honor of the novelist’s ideals. The Papers of Martin Luther King, Jr. have King cite Tolstoy’s work. Paradoxical effects of thought suppression. Wegner et al. 1987. Willpower talks about these 3 categories. They also suggest a 4th called “performance control”, which manages “staying on task”, “perseverance”, and “managing time”. However, in interest of minimalism, I suggest that performance control is a type of impulse control – you stay on task because you’re suppressing your thoughts, emotions, and impulses that want to do other things. Ego Depletion: Is the Active Self a Limited Resource?. Baumeister et al. 1997. Self Control As a Limited Resource: Regulatory Depletion Patterns. Muraven, Tice, Baumeister. 1998. Willpower: Rediscovering the Greatest Human Strength. Coined by leading willpower researcher Roy Baumeister. He literally wrote the book on willpower. Willpower: Rediscovering the Greatest Human Strength. Baumeister. pg 30. From a manuscript submitted for publication: “Engaging in self control heightens urges and feelings.” University of Minnesota. 2010. Caveat: unless you share this article with them! Be nice, and do that. They’ll love you. But… it is also trainable. Carol Dweck, pioneering researcher of the growth mindset, suggests that people who believe they have ‘unlimited’ willpower are more resilient and can regulate their behavior better than those who believe it is finite. How do we explain this contradiction? We amend Baumeister’s original research – It is certainly finite, BUT you use it, it gets stronger. Further, a mental habit of perseverance can be built. I have a book in the works on that matter!